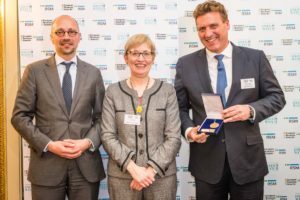 Brussels, 2 March 2018 – Batavia Biosciences has been selected as most innovative company in the Netherlands during an exclusive event held at the British Residence in Brussels for The European Business Awards, Europe’s largest business competition, sponsored by RSM. The award to Batavia was granted by a panel of independent judges including senior business leaders, politicians and academics during a fierce competition involving over 100 companies. The National Winners from each country will face further judging in their category, and the final Category Winners will be announced at the European Business Awards Gala Final in Warsaw, Poland on 23rd May 2018. Batavia Biosciences is also competing in a public vote to be named ‘European Public Champion’ at the Gala Final. Please view Batavia Biosciences’ video and vote at the EBA website.